They say that the first trip of the year decides the ‘travel-tonality’ for the entire year. Considering that it’s snow that I encountered in January of 2014, I’m not surprised that every trip since then has landed me in the hills – whether it is the lower Himalayas of Uttarakhand or the Rockies of Canada. It started with a short trip to Mussoorie and Dhanaulti, then the base camp of Kedarnath along with Chopta-Tungnath-Chandrashila and most recently, Jasper & Banff in the province of Alberta. Even on my most recent tryst with the mighty grey Rockies, I couldn’t help be transported back to the mightier Himalayas that I visited earlier in the year. The Himalayas can be as magnificent as they can be ruthless in different seasons of the year. A sunny summer is contrastingly opposite to the harsh cold winter, when the mountains too, decide to take a break from habitation. Barring some serious expeditions, most casual travellers do not tread here in the winters. But there are few destinations in the lower Himalayas that remain accessible to travellers all year round – only transforming into an unrecognizable avtaars in different months. Fortunately, the trekking circuit of Chopta- Tungnath- Chandrashila is one of them. I hit the most perfect weather in April while heaving myself upto Tungnath. Slow and steady paced, it took me just under 2 hours to tread the stone path from Chopta to the Shiva shrine in Tungnath. Enroute, a number of small dhabas provided a chai and maggi stop. I was surrounded by bright green meadows stretching out and eventually hitting the white snow topped mountains. To imagine, the entire place bathed in white of the winters was equally enthralling, till I actually heard it from the horse’s mouth. Rawat Ji, one of the dhaba owners started telling me about the winters here. A sense of slowness and a strange sense of calmness prevail in the colder months. The dhabas and their patrons shrink to a handful due to much lesser footfalls in the winters. As much as 10 feet of snow greets trekkers during this time of the year, but nothing that cannot be maneuvered by some experience. The sun glistens on the bright white surroundings and snow-draped grey treetops peer out in patches. The scene is nothing but surreal. And even though it seems that you might be a lone explorer, you are bound to bump into a big hairy bhutiya dog, who will graciously accompany you till the peak. 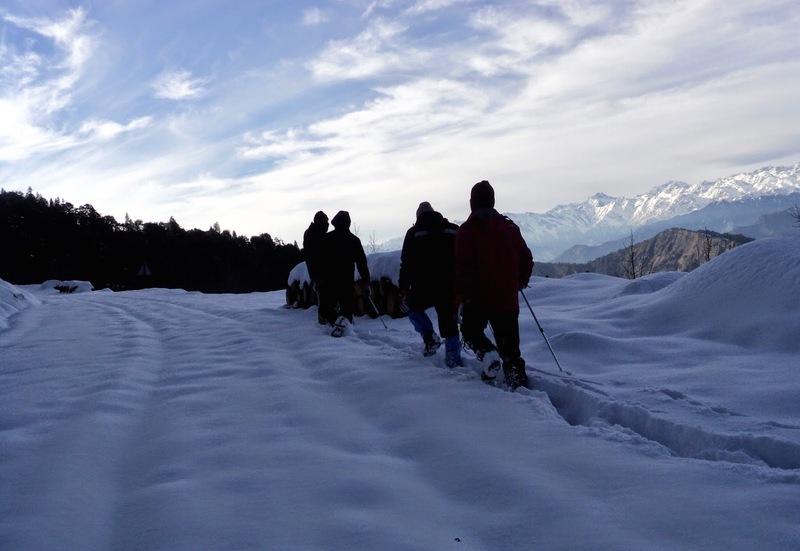 Trekking during the winters can be slightly tricky, but not impossible on this route. Since it is already well defined, regulars can pave out the path in advance, making it easy enough, even for young hikers – perfect for an adventure filled family outing. The key to trekking here during the winter is good outdoor gear, a slightly adventurous spirit and an experienced trekking leader who knows the region well. The other things that work for this route, is the fact that it is barely a 5km stretch, has brilliant access from Chopta and well furnished accommodation at the basecamp. Infact, it works very well for those warming up for larger expeditions and even families who want to explore a different side of Himalayan adventure. While the route till Tungnath is fairly simple, it’s the additional steep kilometer to Chandrashila peak that has many reconsidering the decision. But anyone who has done this trek will tell you not to miss the view from Chandrashila. The small shrine is completely covered in snow, but the view of the Himalayan peaks from here is nothing short of breathtaking. Looking through the viewfinder of my camera on the Chandrashila peak, I could only but imagine how the topography would look during winters – a promise to come back at the whitest time of the year ensued! If nothing else, this would surely make for a unique photographic experience.